Summer Oily Skin Savers — Beauty and Etc. As most of you know, the summer months tends to exacerbate oily skin. This is due to the fact that oily skin is caused by the overproduction of sebum from sebaceous glands. This post is dedicated to the ladies and gentlemen that have normal to oily or just plain oily skin. Listed below are some of the favorite products in my collection that helps my skin combat the oily summer months. The majority of the items listed below I keep in my make-up bag or purse EVERYDAY. You may think a primer should and can only be used as a base when wearing foundation. However, sometimes wear primer even when I'm not wearing foundation. In the summer months a good primer can really help to keep my skin from looking so oily. The Becca Ever-Matte Poreless Priming Perfector is one of my favorites during the summer months. This primer is especially great for those who have oily and combination skin types. It's described as a targeted oil-control primer that helps to minimize pores and keeps to the skin looking matte. Directions: To apply, warm a pea-sized amount in hands and pat onto specific areas of concern like the T-zone. -For touch-ups throughout the day, warm primer in hands and pat over makeup to target oily areas. -Bonus Tip: use as an eye shadow base for oily eyelids. A little of the product goes a long way! It's probably best to purchase the mini size for $15.00 for 0.40 oz. Ingredients: Water, Magnesium Aluminum Silicate, Propylene Glycol, Phenoxyethanol, Methylparaben, Propylparaben, Butylene Glycol, Enantia Chlorantha Bark Extract, Oleanolic Acid. I'm pretty sure everyone that is prone to oil skin is aware of the hack that involves using a toilet seat cover as a way to blot oil from the skin. I would only recommend do that in an urgent situation. There's so many make-up companies on the market that sell oil blotting sheets and they all work the same. I highly recommend to not spend a lot on these blotting sheets. The NYX Oil Blotting Sheets have been my go to for years. They're super afforable and are great to keep in smaller handbags- where every bit of room counts. I also love the fact that oil blotting sheets allow you to remove the oil without disturbing your make-up or adding more products to your face. Directions: Press a single sheet flatly on areas of shine, blot oil, lift and repeat as needed. Ever heard of the term of powdering your nose? To powder one's nose is a euphemistic term, (typically of women) to visit a lavatory to use a toilet, reapply makeup. With so many translucent powders on the market, its so hard to recommend a specific brand or formula that would be suitable for everyone. I will say you should pick a translucent that is pressed as its easier to travel with. The Becca Tinted Blotted Perfector (tinted version) has been my favorite for a little over a year now. I'll admit I was skeptical about how a tinted powder could also be translucent. I was so afraid that I was going to look washed out or ghostly. I quickly learned that the magic occurs when you apply the powder with a powder brush. The only downside is the powder appears to be being phased-out. 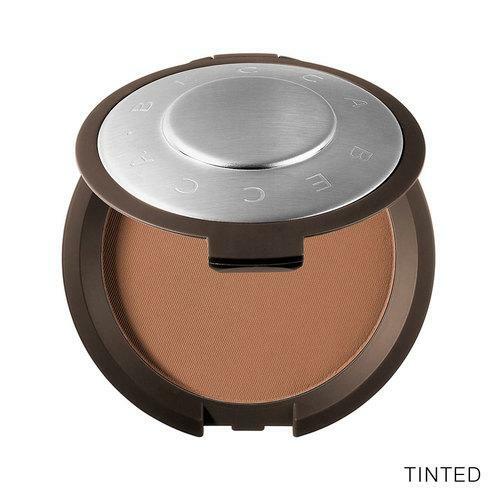 Tt's currently only $19 on the Becca website. I don't usually carry around a translucent powder due to how messy they can be. But when getting ready at home, I finish off with a translucent powder. The Laura Mercier Translucent Loose Setting Powder is a lightweight powder, but very effective to setting make-up for a matte effect. As mentioned in my previous post, however during these summer months I have really come to love the the Becca Hydra-Mist Set & Refresh Powder as it's great to set makeup, refresh/cool, translucent powder and provides no photo-flashback. Directions: Apply immediately after foundation or apply alone by dipping the brush into powder and taping off the access. The powder can be applied all over the face or to target areas. The Hydra-Mist & Refresh powder may also be reapplied during the day to refresh. If you're interested in seeing my full review on the Becca Hydra-Mist Powder, click here ! Overall, the Becca Hydra-Mist Powder is my current favorite powder for the summer. It feels refreshing and has helped to prolong my makeup along with keeping me matte! Ingredients: Water, Dimethicone/Vinyl Dimethicone Crosspolymer, Polymethylsislesquioxane, Silica Silylate, Glycerin, Dimethicone, Silica, Mica, Dipropylene Glycol, Phenoxyethanol, Sodium Dehydroacetate, Potassium Sorbate, Titanium Dioxide (Ci 77891), Iron Oxides (Ci 77491). The Supergoop Defense Refresh Setting Mist sunscreen retails for $28.00 and is a makeup setting spray that helps to control oil and provides protection against UV rays. The mist is described as an antioxidant broad spectrum sunscreen as it protects your skin from both types of UV rays. The Supergoop sunscreen is probably one of the easiest on the market to use. It can be sprayed on to the face prior to your make-up application or after. I spray this in the morning before leaving my house and I also keep the mini version of the spray in my handbag for midday touch ups! The fact that that this spray contains sunscreen and helps to keep me matte, makes it a must have to keep in my purse, especially during the summer months. Sunscreen is an extremely important step in my skincare routine as many of the products that I use contain acids (aha, bha, lactic and etc. ), which makes my face sensitive to the sun and can be very drying (thus producing more oils). The Supergoop Setting Mist is great as it combines my sunscreen and a matte finishing spray all in once. Ingredients: -Avobenzone 3%, Homosalate 4%, Octisalate 3%, and Octinoxate 6%: Deliver broad-spectrum sun protection. -Silica Silylate: Helps to control oil and reduce shine. -Rosemary Leaf Oil and Peppermint Stem/Leaf Oil: Soothe inflammation while providing an uplifting sensory experience. Alcohol Denat, Butyloctyl Salicylate, Isododecane, Dicaprylyl Carbonate, Silica Silylate, Water, PVP, Caprylic/Capric Triglyceride, Mentha Piperita (Peppermint) Stem/Leaf Oil, Mentha Viridis (Spearmint) Leaf Oil, Rosmarinus Officinalis (Rosemary) Leaf Oil. I hope these tips were helpful. If you have your own tips, please share them below! I'm always interested in finding new products and techniques.